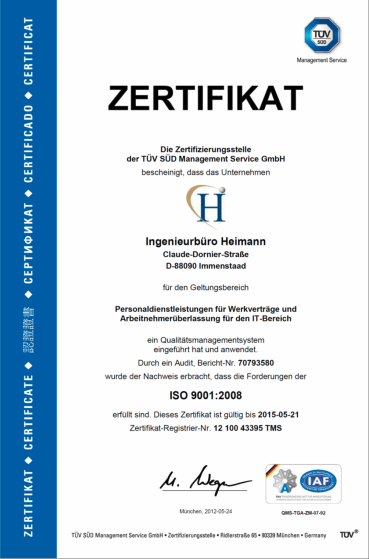 Since 2012, Heimann Engineering is certified according to ISO 9001: 2008 and has been successfully recertified in June 2014th. We take our ISO certifications seriously. We have recorded our processes systematically and improve them constantly. Through this we can deliver the quality our customers expect and demand from us. Since 2013, the Quality Management System of Heimann Engineering meets the medical standard of ISO 13485: 2008. The ISO 13485 is the ISO standard that represents the requirements of a comprehensive management system for the design and manufacture of medical devices.